At the time, Angola was still a Portuguese colony. Gulf, an American company, had begin drilling oil in the country since 1968, paying the colonial government $500 million a year and thus funding an ongoing war against rebel armies. Sadly, of course, there were in fact more than “two sides in a war.” Competing rebel organizations—formed from communities of different ethnicities—were supported by the Soviet Union; Cuba; China; the apartheid regimes in Rhodesia and South Africa; and the US. 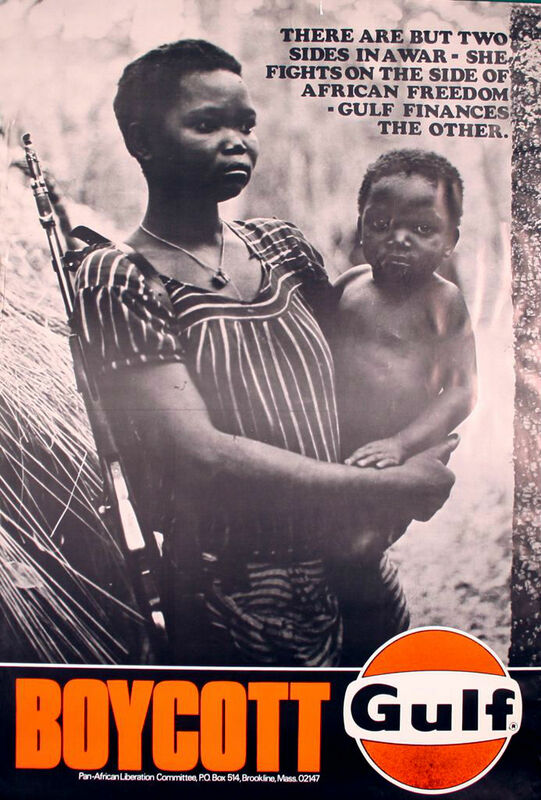 A long, devastating civil war lasted from Angola’s independence in 1975 into the 2000’s. Although the country holds vast potential natural resources in diamonds, oil, gold, and copper, wealth is concentrated in the hands of a few and most Angolans continue to struggle without basic resources and with the trauma of the war’s aftermath. This entry was posted in Uncategorized and tagged 1970's, 20th Century, Africa, Angola, Capitalism, Colonialism, Photography, Women. Bookmark the permalink.